“Remember when we roasted broccoli and it was soooo good?” said my husband Dave a couple weeks back. That started the process of me playing with different roasted broccoli techniques and spicing to find my favourite combo. We ate broccoli every night for dinner for almost 2 weeks, ha ha! Funny neither of us got sick of it. We love our broc! 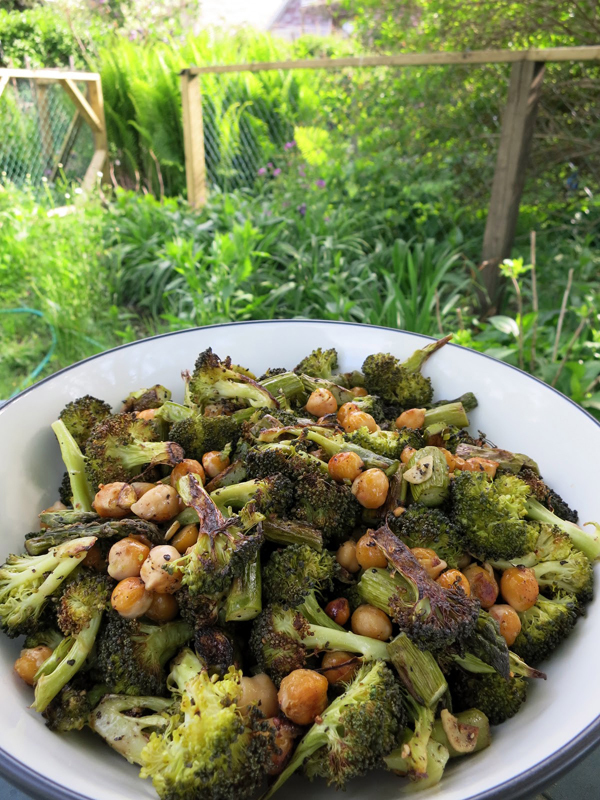 My recipe for Roasted Black Pepper Broccoli with Chick Peas & Asparagus was the winner. The roasting makes all the flavours rich and also creates a crispiness that you’ll love. And yes, the generous amount of black pepper gives this dish some heat, so if that’s not your thing just cut down the amount. Preheat oven to 400 degrees F. Cut the broccoli into florets, but not too small as shrinkage will happen with roasting. Wash well then use a salad spinner to remove water. Set on a dish towel to continue drying. If the broccoli is wet, it won’t roast, it’ll steam. Also, cut the asparagus into pieces, then wash and dry using the same method. Mix oil, pepper and garlic in a large mixing bowl. Add the broccoli florets, asparagus pieces and chick peas. Toss well. Pour the mixture onto a foil or parchment lined baking sheet. Roast uncovered for 40 minutes, or until the tips of the broccoli are browned. When it’s done, place in a serving dish, drizzle with lemon juice and garnish with the zest. Done!